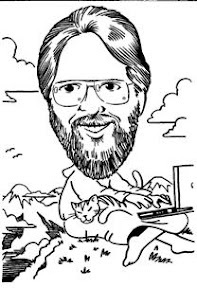 As I mentioned earlier, the big “Tax Reform” law, aka the Tax Cuts and Jobs Act (TCJA), that was passed and signed into law in late December 2017, was so hastily and sloppily written that it contains several areas that are so vague and contradictory that they have everyone puzzled as to how they should be applied in real life. One of these is the matter of deducting the costs of business meals and entertainment. While it will most likely take several years to arrive at a firm and definitive interpretation of the law, we who do reside in the real world don’t have the luxury of waiting that long. We need to know right now how to advise our clients. 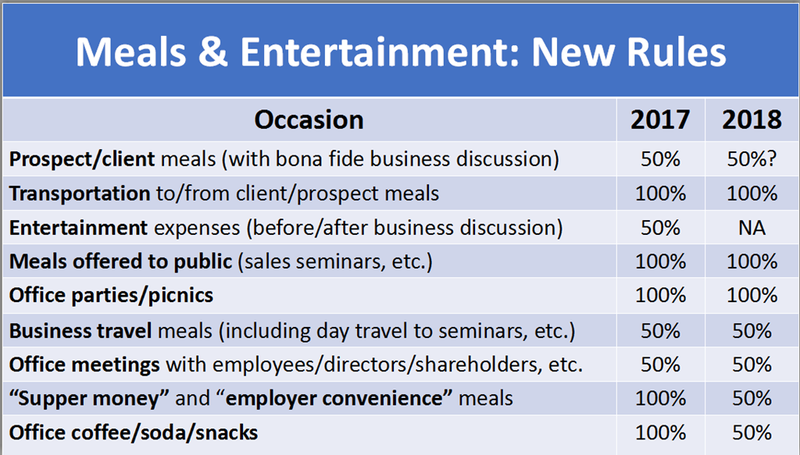 To that end, the fine folks at TaxCoach have assembled a handy chart comparing the rules for deducting various types of meals and entertainment expenses under the old 2017 tax law versus the new 2018 law. They shared it with us during today’s weekly online strategy meeting. Theirs was a PowerPoint file, which I have converted to its basic graphic and text components for this blog post. The following chart and explanation are the creations of TaxCoach. Click on the chart below for a more legible full size version. Here are some changes you probably won’t like. Like a kitchen food processor, the new law slices, dices, and purees some of the most popular deductions for meal & entertainment expenses. The chart summarizes deductions under the old and new law. So, which is it? Are traditional business meals still deductible or not? Well, we just don’t know. So until we get some guidance, prudence suggests you should continue to document those expenses, including the business purpose of the meal, to protect your deductions if we get clarification on the question. Better to have your ducks in a row and not need them than to need them and not have them! Transportation expenses to and from business meals are still deductible, as they’re governed by a different section of the code that remains good today. Unfortunately, there’s no doubt at all that the old “entertainment” deduction is gone. Under the old rules, you could deduct 50% of the cost of any entertainment expenses that took place directly before or after a a substantial, bona fide discussion directly related to the active conduct of your business. Deductions included the face value of tickets to sporting and theatrical events, food and beverages, parking, taxes, and tips. The new law repeals that deduction, regardless of how much business you discuss at the event or what business entity you operate. Now, none of those expenses are deductible – not even transportation to and from the venue. The new law also tightens rules for deducting the cost of providing food and beverages to your employees under the “convenience of the employer” or “de minimis” fringe benefit rules. The new law cuts those deductions to just 50%, and eliminates them entirely after 2025.